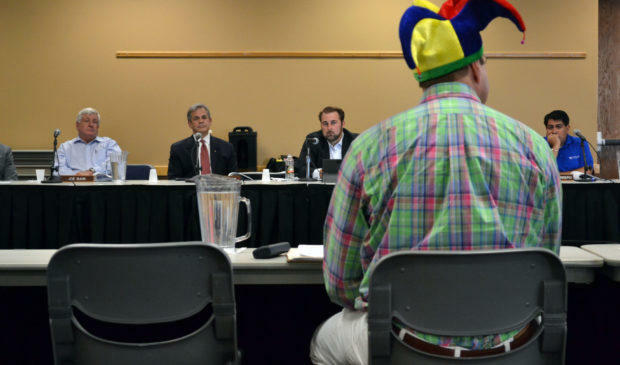 Travis County GOP Chair Rob Morrow, in his signature jester's cap, testifies before CAMPO on August 8, 2016. The Capital Area Metropolitan Planning Organization gave the Lone Star Rail District (LSTAR) an all but fatal kick in the caboose on Monday night. Members of the CAMPO Transportation Policy Board overwhelmingly voted to begin the process that will remove LSTAR from CAMPO’s long-range plan. The resolution also includes a request to the Texas Department of Transportation to pull funding for LSTAR’s ongoing environmental impact study. Only San Marcos Mayor Daniel Guerrero voted against the measure; Travis County Commissioner Brigid Shea and TxDOT District Engineer Terry McCoy abstained. The vote was the climax of LSTAR’s slow-motion derailment, which began in February, when Union Pacific informed the district that the company was removing its coveted rail line from consideration in the long-gestating passenger rail service between Georgetown and San Antonio. It also capped off an extended wrangling session over the precise wording of the CAMPO board’s intent at what was an unusually crowded meeting on Monday night. Prominent stars of the local transportation and civic constellation showed up in order to voice their opinions during a brief public hearing. Former Capital Metropolitan Transportation Authority Board Member John Langmore and transit activist Roger Baker both spoke in favor of continuing to search for multimodal options along the Interstate-35 corridor, while anti-transit activist Jim Skaggs and Travis County Republican Party Chair Rob Morrow – wearing his signature jester’s cap – urged the board to kill LSTAR. After the public comments, CAMPO Executive Director Ashby Johnson laid out the resolution that was included in the meeting’s agenda. He explained that Union Pacific’s refusal to participate with LSTAR raised terminal questions about the district’s proposed financial model. He said the staff recommendation was to pull the $2.05 billion project from CAMPO’s 2040 planning document. Johnson went on to explain that the procedure for executing that recommendation would involve a 30-day public comment period, 10 open house meetings across CAMPO’s six member counties and another public hearing at the board’s scheduled meeting in September. A final vote to formally pull the plug on LSTAR would then be set for the board’s Oct. 10 meeting. While several representatives of the suburban jurisdictions voiced their support for the resolution at hand, Austin Mayor Steve Adler proposed an alternative resolution that would set the final decision for December. He also requested that CAMPO board members arrange a meeting with Union Pacific officials for one last round of discussions. Adler was quickly talked down from the December date back to the October deadline. After a lengthy discussion, Cedar Park Mayor Matt Powell questioned why Adler hadn’t spearheaded a meeting with Union Pacific in the six months since the company originally pulled out of the LSTAR planning process. Adler explained that his attention had been consumed with the federal Smart City Challenge that Austin lost to Columbus, Ohio, in June. After that, Adler said, he was busy with his economic development trip to Asia. Ultimately, the tortuous discussion – fraught with a failing PA system – over whether to organize a last-ditch sit-down with Union Pacific rankled Travis County Commissioner Gerald Daugherty. “This is almost ridiculous,” Daugherty began before correcting himself. “No, no. This is ridiculous. What part of ‘no’ don’t we understand?” Daugherty said that Union Pacific had consistently sent signals since 2002 that it had little interest in participating in the LSTAR scheme, which would run passenger service through cities on existing rail lines while relocating freight traffic to an as-yet-unbuilt corridor to the east of the current alignment. Finally, Chair Will Conley opted to include Adler’s language about a new meeting with Union Pacific. After the meeting, LSTAR Deputy Executive Director Joe Black surmised that the meeting could bear some fruit. In any contingency, there still existed apparent support among the board members, including Conley, for a renewed search for passenger rail service between the Austin and San Antonio metros. CAMPO’s San Antonio counterpart, the Alamo Area Metropolitan Planning Organization (known as AAMPO), seems to be in a similar situation. On Monday afternoon, AAMPO’s executive committee voted to pass on the opportunity to provide funding for LSTAR’s environmental impact study. However, spokeswoman Linda Vela told the Austin Monitor that the committee members expressed a desire to continue exploring multimodal options with CAMPO along the I-35 corridor. 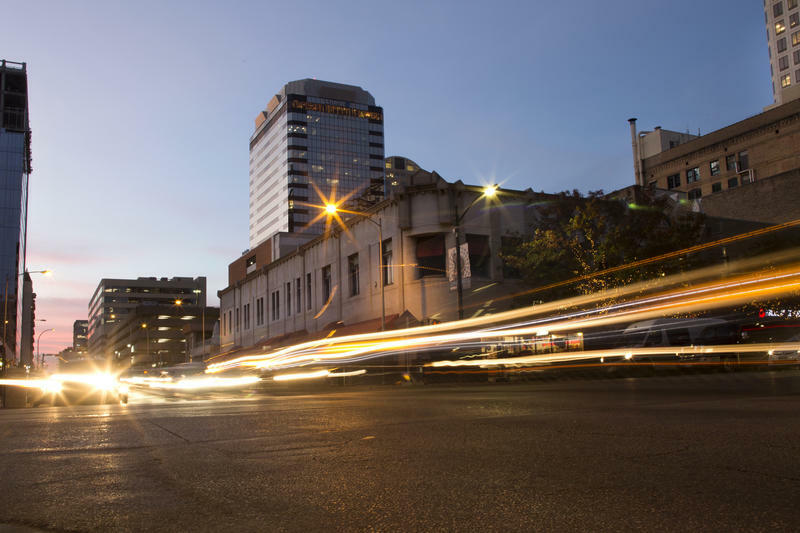 The Mayor's Bond Proposal Relies on 'Smart Corridors.' So, What Makes a Street Smart? Cars, buses and trucks idle at the four-way intersection at Guadalupe Street and West Dean Keeton Street. A horde of prospective students takes to the crosswalk, the timer counting down. From the Austin Monitor: It appears that United States Secretary of Transportation Anthony Foxx has decided that Austin is not a Smart City. On Tuesday, Ohio’s two members of the U.S. Senate announced that their state capital, Columbus, won the U.S. Department of Transportation’s Smart City Challenge and the $50 million purse that comes with the title. 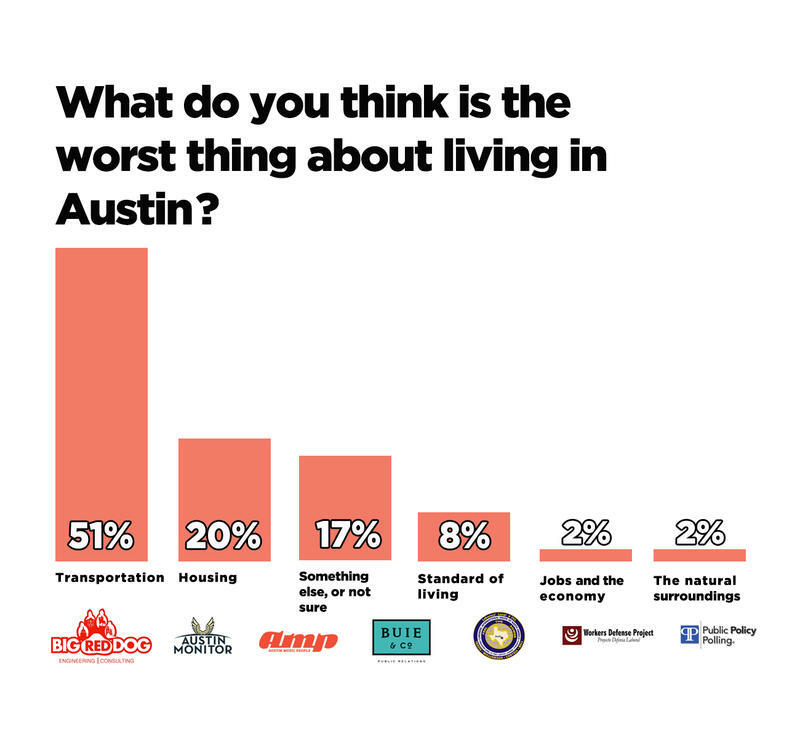 From the Austin Monitor: A poll commissioned by the Austin Monitor with the help of sponsors shows that more people approve of Mayor Steve Adler’s job performance than that of City Council as a whole — with 51 percent of respondents endorsing Adler’s leadership, compared to 40 percent approval for Council.